The VoteIt is a U.S. startup based in New Orleans who want to create ways to assist citizen groups to use tools vote in real time. So far, nothing new... There are many tools and websites that offer the same service for free or paid. 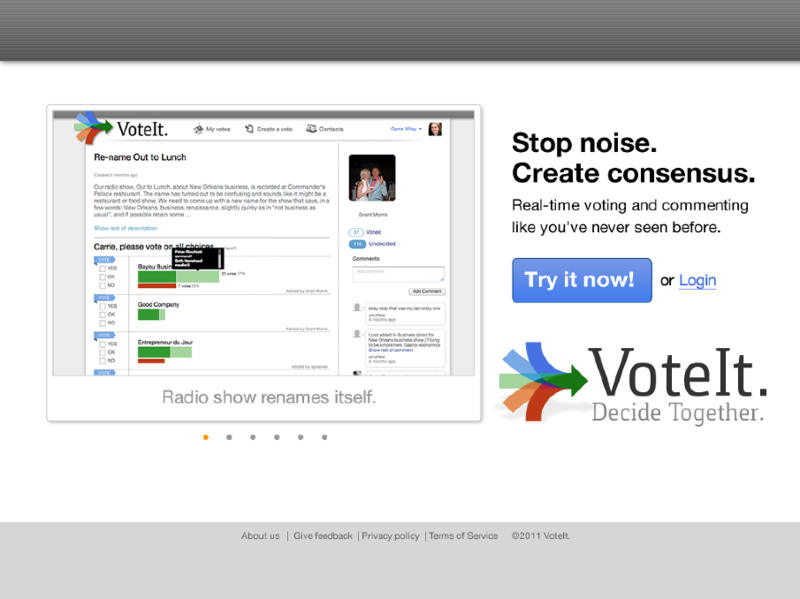 But VoteIt promises more. Promises that companies, associations and simple citizen groups or communities can improve their decision making process enriching their votes with interaction and feedback with comment threads, polls at the time of collection, integration with email and complex approval workflows. The system incorporates VoteIt rewards transparency and allowing there a way to record the progress and completion of voting. The system allows VoteIt simplify the decision process by meeting in person, mail or video conferencing, enabling decision making without the costs associated with travel or face the confusion that often arises from the exchange of cross dozens of emails on a given subject. The system is currently being used internally by the Swedish Green Party with very positive results.